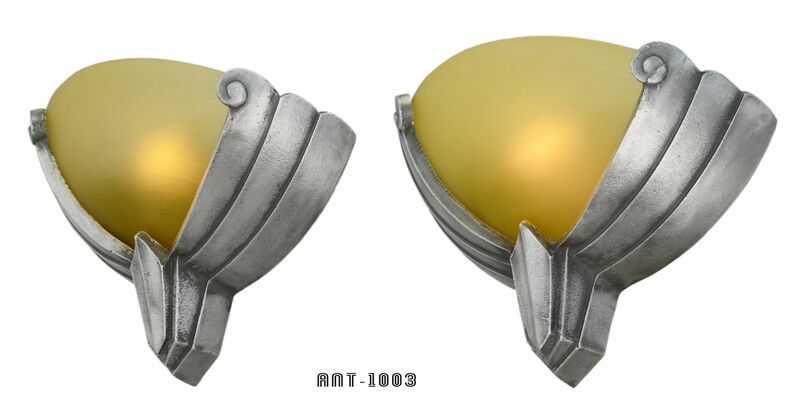 A very iconic streamline pair of white metal sconces with acrylic style amber shades. The metal finish is pewter while the shades have that typical streamline simplicity and are simply a quarter bowl shape. When acrylic was used during the deco times, often there are burn marks on the shades...but there are none here. However, we would suggest using low heat LED bulbs to make sure that this condition remains good. There is some roughness to the frames caused by the original casting process...not serious...but as cast and 1930s produced. It’s pretty plain in the pictures...so...not perfect...but nice antiques. Electrical: These sconces have been totally re-wired in our UL shop. Normal Medium base sockets, for everyday medium base bulbs, were installed. However, we also added a removable adapter that changes medium base bulbs to chandelier sockets so you can choose your size and shape and type of bulb. We will give you a LED filament bulb with these sconces but you can change it out if you do not agree with our choice. We just think it looks good and works cool with this bulb. Measurements: Overall height is 7 1/2” from the top of the shade to the bottom of the metal backplate. Overall widest part of the case is 10 3/4” wide. Projects into the room 4”. Price: $750.00 for this Streamline pair of Art Deco sconces, plus careful packing and shipping.